Don’t take a roof over your head for granted. My first “real” job was at a bagel shop in Fresno, CA when I was 15. As a cashier only scheduled to work on weekends, I got to know what “busy at work” really meant. I was regularly in a bagel and coffee-filled frenzy for 10 hours every week. It was at that job that I got to learn the true value of a dollar, especially when my paychecks sometimes only came out to cover one tank of gas. Early on in my time at the bagel store, I found out that my manager regularly left the unsold bagels in a crate at the back door as an offering to the people in the community who were in need. I was glad to see that our bagels weren’t going to waste, and I was proud to work for someone who wanted to feed others. Over 75 percent of the homeless population in California is made up of single males. Where I’m from, headlines such as City of Fresno Criminalizes Poverty, Fresno Police Break Homeless Man’s Wrist and City of Fresno Finds New Ways to Harass the Homeless have consistently graced the pages of local publications for the past 15 years. According to a recent census, 27.5% of people living in Fresno County are living in poverty. This all goes to show that people in my community need help. One morning, a disheveled man walked into the bagel store. His clothes were tattered, his beard was grown out and scraggly, and he looked very pale. He did not approach the register, but I offered him a cup of hot coffee anyway. I noticed that he was carrying one of our paper coffee cups already, one that looked to have been recycled many times. He didn’t speak as he stood in between the doorway and the cash register. All of a sudden, he dropped to the floor and started seizing. Terrified, I yelled for the manager and an ambulance arrived quickly. The man was taken to the hospital, which was right across the street. It is not a pleasant experience to see someone fall to the floor and start convulsing. I was a witness of someone’s medical emergency, a man I later learned was a regular. What set him apart from the other regular customers was that he could not pay. In order to provide himself with shelter, even just for a few hours, this man would be sent to the hospital where the ER could offer him a bed and some juice. The man came back later that same day with a hospital bracelet strapped to his wrist. He accepted the coffee this time, strolling around the store in a daze before wandering out the back door. As small business employees, why couldn’t we offer him more than just a coffee? He was desperately seeking shelter and sustenance. When the homeless man actually walked through the restaurant doors instead of grabbing leftover bagels out back, my manager’s sympathy vanished. Confronted with the needs of a real homeless person, the manager saw a smelly bum who was disturbing customers, to whom food was a commodity. For this man, food was a rarity, especially during business hours. I never saw him again. This situation alerted me to the fact that desperate people exist in my community. Six years ago, when the bagel store incident occurred, I became more sympathetic. 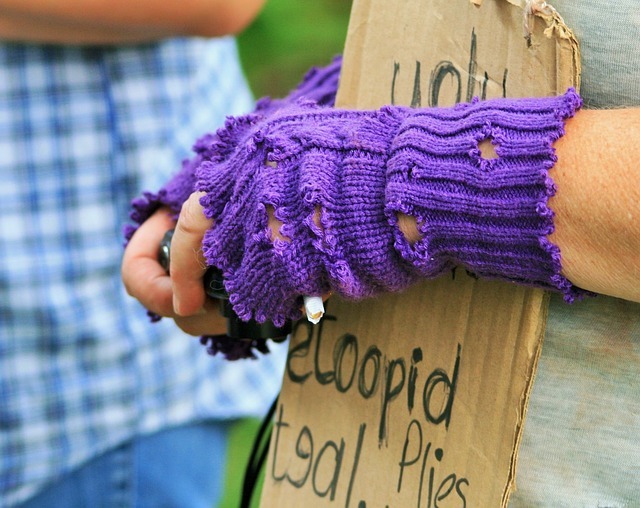 However, sympathy isn’t all we need to care for the homeless—it’s the least we can do. Even though the homeless population in Fresno has significantly decreased in the past few years, I can’t say that I’ve done anything to help make that happen. I made the conscious choice to be a more sympathetic person sure, but what was I doing? The answer is nothing. My advice for everyone is to turn your sympathy into action. Giving time, energy, and resources are the first steps toward making sure that everyone in your community can afford to support themselves and enjoy a bagel without judgment. If you are feeling inspired and willing and able to lend a hand, there are plenty of ways your time and talents could be used to help those in need. Visit your local food bank to see how you can donate or volunteer to prepare and serve meals. I have done this before, and it was a very fun and accessible way for me to give back that I wish I would have done more than once. If you struggle to find free time, bringing clothes and household items to a Goodwill store will directly contribute to job training and placement programs. If you are more into independent action and interaction, gathering up your hotel-sized toiletries and dentist-issued toothbrushes and offering them to individuals asking for help around town could make all the difference.